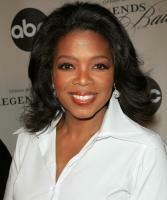 See the gallery for quotes by Oprah Winfrey. You can to use those 8 images of quotes as a desktop wallpapers. What material success does is provide you with the ability to concentrate on other things that really matter. And that is being able to make a difference, not only in your own life, but in other people's lives. I have a lot of things to prove to myself. One is that I can live my life fearlessly. My philosophy is that not only are you responsible for your life, but doing the best at this moment puts you I the best place for the next moment. Doing the best at this moment puts you in the best place for the next moment. What God intended for you goes far beyond anything you can imagine. So go ahead. Fall down. 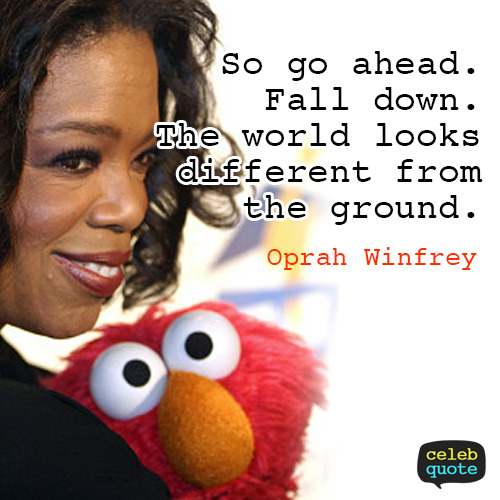 The world looks different from the ground. You CAN have it all. You just can't have it all at once. Excellence is the best deterrent to racism or sexism. I feel that luck is preparation meeting opportunity. 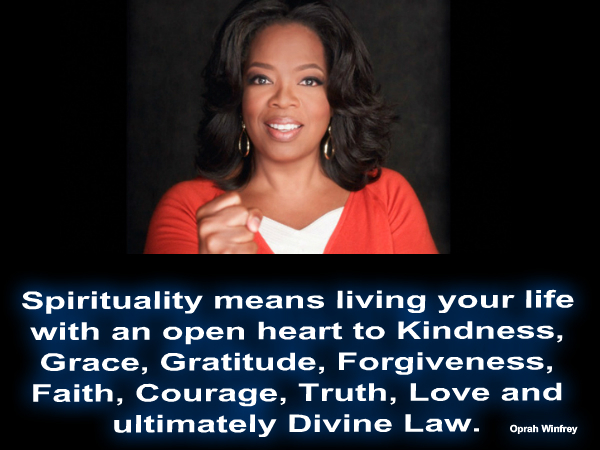 Understand that the right to choose your own path is a sacred privilege. Use it. Dwell in possibility. I'm black, I don't feel burdened by it and I don't think it's a huge responsibility. It's part of who I am. It does not define me. The whole point of being alive is to evolve into the complete person you were intended to be. I had no idea that being your authentic self could make me as rich as I've become. If I had, I'd have done it a lot earlier. The thing you fear most has no power. Your fear of it is what has the power. Facing the truth really will set you free. If you want to accomplish the goals of your life, you have to begin with the spirit. I was raised to believe that excellence is the best deterrent to racism or sexism. And that's how I operate my life. When I look into the future, it's so bright it burns my eyes. It does not matter how you came into the world, what matters is that you are here. What I know is, is that if you do work that you love, and the work fulfills you, the rest will come. You know you are on the road to success if you would do your job, and not be paid for it. I always knew I was destined for greatness. My idea of heaven is a great big baked potato and someone to share it with. If you come to fame not understanding who you are, it will define who you are. I don't think you ever stop giving. I really don't. I think it's an on-going process. And it's not just about being able to write a check. It's being able to touch somebody's life. It's much easier for me to make major life, multi-million dollar decisions, than it is to decide on a carpet for my front porch. That's the truth. I'm not even kind of a lesbian. 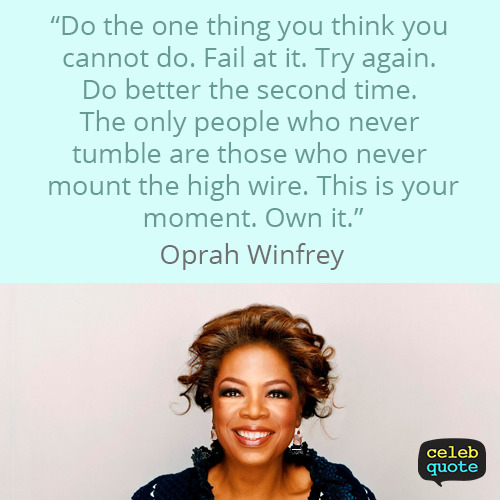 Much more quotes by Oprah Winfrey below the page. Unless you choose to do great things with it, it makes no difference how much you are rewarded, or how much power you have. I remember a specific moment, watching my grandmother hang the clothes on the line, and her saying to me, 'you are going to have to learn to do this,' and me being in that space of awareness and knowing that my life would not be the same as my grandmother's life. Books were my pass to personal freedom. I learned to read at age three, and soon discovered there was a whole world to conquer that went beyond our farm in Mississippi. I'm sick of people sittin' in chairs stating their problems. Then we roll the videotape... then we have our experts on the topic... I'm in the 'What's next?' phase of my career. My first day in Chicago, September 4, 1983. I set foot in this city, and just walking down the street, it was like roots, like the motherland. I knew I belonged here. Lots of people want to ride with you in the limo, but what you want is someone who will take the bus with you when the limo breaks down. Be thankful for what you have; you'll end up having more. If you concentrate on what you don't have, you will never, ever have enough. The more you praise and celebrate your life, the more there is in life to celebrate. 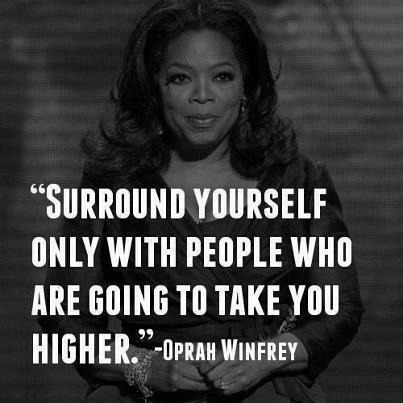 Surround yourself with only people who are going to lift you higher. I am a woman in process. I'm just trying like everybody else. I try to take every conflict, every experience, and learn from it. Life is never dull. Real integrity is doing the right thing, knowing that nobody's going to know whether you did it or not. Where there is no struggle, there is no strength. Turn your wounds into wisdom. Passion is energy. Feel the power that comes from focusing on what excites you. 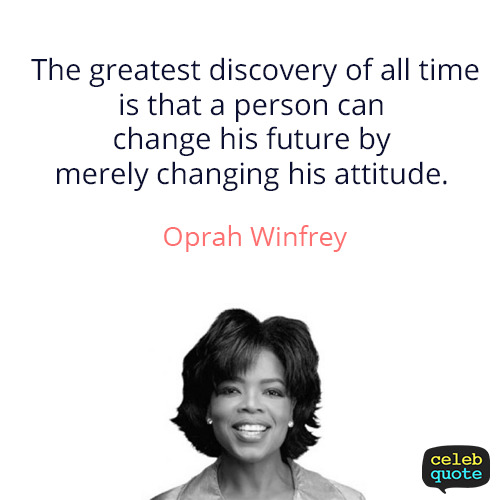 The greatest discovery of all time is that a person can change his future by merely changing his attitude. Think like a queen. A queen is not afraid to fail. Failure is another steppingstone to greatness. She is the mother I never had, she is the sister everybody would want. She is the friend that everybody deserves. I don't know a better person. It isn't until you come to a spiritual understanding of who you are - not necessarily a religious feeling, but deep down, the spirit within - that you can begin to take control. Breathe. Let go. 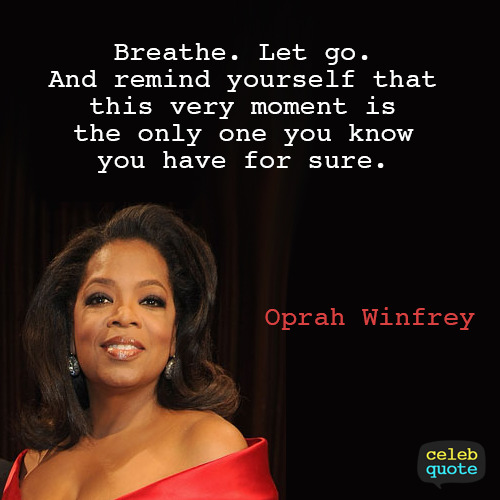 And remind yourself that this very moment is the only one you know you have for sure. The biggest adventure you can take is to live the life of your dreams. The struggle of my life created empathy - I could relate to pain, being abandoned, having people not love me. As you become more clear about who you really are, you'll be better able to decide what is best for you - the first time around. 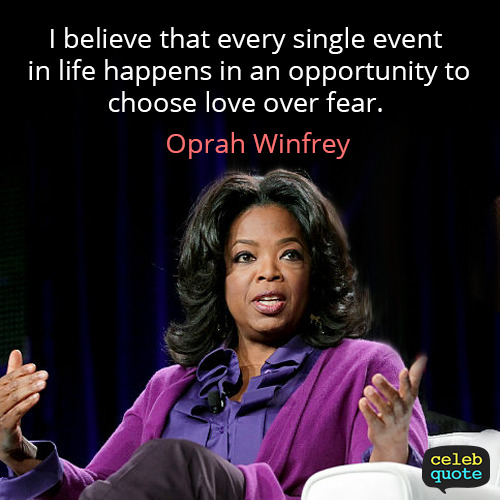 I believe that every single event in life happens in an opportunity to choose love over fear. Biology is the least of what makes someone a mother. Follow your instincts. That's where true wisdom manifests itself. For everyone of us that succeeds, it's because there's somebody there to show you the way out. I don't think of myself as a poor deprived ghetto girl who made good. I think of myself as somebody who from an early age knew I was responsible for myself, and I had to make good. I don't believe in failure. It is not failure if you enjoyed the process. I still have my feet on the ground, I just wear better shoes.